In a remote corner of the Michigan woods, behind rusted iron gates and crumbling walls, lies a notorious sanitarium and its forgotten cemetery. The ruin is empty now, and the bulldozers have come to raze it. But as they do, a secret emerges. The coffin of Claudia DeFoe, the youthful love of Louis's foster father Phillip, is empty. 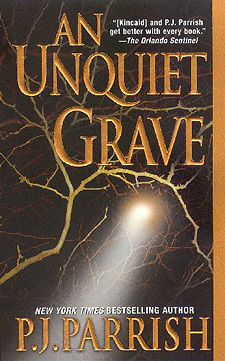 When Louis tries to find the remains, he crosses paths with a reporter searching out rumors that a former patient, assumed dead, is alive and killing again. In Hidden Lake hospital, where the walls are stained with secrets and the air thick with the history of lingering screams, Louis is on his darkest journey yetinto the mind of a deranged killer and into the locked rooms of his own psyche. "Parrish's gripping and atmospheric new Louis Kincaid novel is a quality read that will remind many of Dennis Lehane. Parrish manages to make would could be a formulaic plot fresh, both through her gift at creating sympathetic main and secondary characters and through her skill creating suspense and sustaining a mood. The author's ability to raise goose bumps puts her in the front rank of thriller writers." "A wonderfully tense and atmospheric novel. Keeps the reader guessing until the end." "A standout thriller. It is an intriguing and atmospheric story set largely on the grounds of an abandoned insane asylum, a haunting location that contains many dark and barbarous secrets. With fresh characters and plot, an suspense novel of the highest order."